Marshall, L. and Marshall. (2010). Nuclear energy. In B. Warf (Ed. ), Encyclopedia of geography. [Online]. Thousand Oaks: Sage Publications. Available from: https://search.credoreference.com/content/topic/nuclear_energy [Accessed 25 April 2019]. Marshall, Lisa, and Marshall. "Nuclear Energy." Encyclopedia of Geography, edited by Barney Warf, Sage Publications, 1st edition, 2010. Credo Reference, https://search.credoreference.com/content/topic/nuclear_energy. Accessed 25 Apr. 2019. Images of the electric grid, cooling towers, atomic bombs, and Hollywood productions serve as examples of what may come to mind when “nuclear energy” is mentioned. It has a complex narrative, occupying a noteworthy place in society. What nuclear energy represents to current debates on solutions to increasing energy demand, reduction in carbon emissions, energy independence, and national security is juxtaposed with arguments of nuclear proliferation, radioactive contamination, nuclear accidents, and “not in my backyard” sentiments. With a growing presence around the globe with 440-plus commercial reactors in operation or being built, an argument is being made that there is a 21st-century nuclear resurgence in the making. Nuclear energy engages the subatomic realm, natural landscapes, and geopolitical space in particular ways—an engineered solution to some and a problem to others. 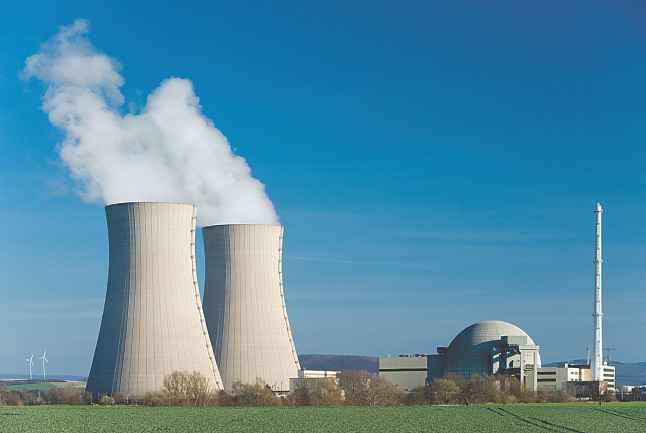 Nuclear energy, also known as atomic energy, occurs with the splitting of a specific atom. The sustained process is known as nuclear fission; heat released from the substance is harnessed to produce steam in commercial nuclear reactors. Through a series of progressions, the work of the steam becomes electricity. The atom used in commercial nuclear power plants is uranium. This ore is crushed and leached with acid to obtain a concentrated amount of uranium oxide known as yellowcake. In nature, this isotope of uranium exists at low concentrations, typically 0.7%. So that it can be used in commercial reactors, it goes through an enrichment process, increasing its concentration to 4.0% to 5.0%. Pellets that include the enriched uranium are placed in fuel rods that, in turn, are configured into fuel assemblies to make up the reactor core. There are several reactor designs throughout the world; the two predominant designs in the United States are known as boiling water reactors and pressurized water reactors. The electricity produced in these and other commercial reactors is known as nuclear power. Nuclear energy and nuclear power are used interchangeably for the simplified representation of the splitting of atoms. Nuclear energy can also be derived from joining the light nuclei of atoms with the heavier ones. Two isotopes of hydrogen are combined into helium; the energy released will be harnessed for eventual fusion reactor applications. At present, the mechanics of a fusion reactor is not complete for commercial applications; it is in the research realm—more energy is currently used for the reaction to occur than is released. National and international initiatives continue, the latest being a joint international research and development project, ITER, in Southern France. Scientists who played a key role in research that led to fission power production included the British nuclear pioneer Ernest Rutherford. He brought attention to the heat produced by the atom radium. French scientists Marie and Pierre Curie, along with Henri Becquerel, discovered radioactivity; the German American scientist J. Robert Oppenheimer is considered the father of the atomic bomb; and the Italian scientist Enrico Fermi discovered fission. From the work of these scientists on the atom has come the work of the atom on and for society. Currently, research is under way to usher in the next generation of reactors; they are being designed to be modular in construction, to possess shorter building times, to have fewer pumps and valves, and to use less uranium to produce the desired level of energy. Idaho National Laboratory was named the lead laboratory by former President George W. Bush to shepherd the United States into the next stage of nuclear power production. Through the U.S. Energy Policy Act of 2005, initiatives for a nuclear renaissance are being constructed. Internationally, the resurgence is showing more traction; for instance, in 2004, Finland started construction on a next-generation Areva-designed nuclear reactor. Companies such as Areva, Westinghouse, and General Electric-Hitachi, in association with the governments of various countries, are building in Japan, China, and India. Discussions are under way in countries such as Mexico, Canada, and South Africa. The United States hasn't built a new commercial nuclear reactor in decades, but there are several consortia (vendors such as companies named earlier along with state utility companies) that wish to take advantage of the tax credit incentives and liability insurance. They are submitting applications to the U.S. Nuclear Regulatory Commission for combined construction and operating licenses. The review process takes several years; however, there have been possible construction locations announced by utilities. For example, the North Carolina-based Progress Energy has named Florida and then North Carolina as build locations. Nuclear energy was ushered in as an offshoot of scientists’ work on behalf of military defense. During World War II, the atomic bomb was used on Hiroshima and Nagasaki, Japan, as a response to the Pearl Harbor bombings. An enrichment level closer to 90%, as opposed to the 4% to 5% range seen in commercial nuclear power plants, was used. This technological use solidified the nuclear arms race, and nations such as Britain, China, and the Soviet Union developed a military arsenal in the postwar, Cold War era. Other nations subsequently joined the nuclear race with more of a power production perspective. Japan, France, and South Africa were among these nations. In 1953, the then U.S. President Dwight Eisenhower pledged before the United Nations the pursuit of nuclear science and technology for peaceful purposes. The U.S. Department of Energy and the U.S. Nuclear Regulatory Commission continue to work with industrial and public stakeholders to answer concerns and move forward on nuclear energy production. As of 2008, there were more than 443 nuclear reactors worldwide (representing 19.4% of the global nuclear power) and 104 nuclear reactors in the United States (19.9%); France represents 80% and Canada 12%. Nuclear power is used as base load—reactors run year-round, except when down for refueling and maintenance—contributing to guaranteed electricity for households and industry. According to the Department of Energy, U.S. electricity demand is expected to increase by 40% to 50% by 2025. And as industrialization occurs around the world, there will be an increased demand for fossil fuels, driving some of the discussions around energy independence and global warming reduction measures to include renewable and nuclear energies as possible solutions. Similarly, in a post-9/11 world there has been concern expressed about nuclear terrorism—a hijacked plane crashing into a nuclear power plant or the use of stolen radioactive material to make a dirty bomb—not to mention the lingering historical references and/or concerns around another Chernobyl accident or Three Mile Island incident. What affects would a leakage have on communities near nuclear power plants? What evacuation plans are in place? What measures exist for the safe operation of nuclear power plants? Where should nuclear waste be stored? Military and industrial nuclear waste, slated to eventually reside at the Yucca Mountain National Repository in Nevada, is under litigation. The nuclear industry has launched public outreach initiatives to answer these and other questions. At the same time, antinuclear organizations are engaging communities around issues of environmental justice, land rights, and safety practices. The geographical space of nuclear energy has been reenergized. The politics of engineered landscapes and their necessity plays out on several levels as demand places pressure on natural resources and a geography of necessity is amplified. Bird, K., & Sherwin, M. J. (2005). American Prometheus: The triumph and tragedy of J. Robert Oppenheimer. New York: Vintage. Bodansky, D. (2008). Nuclear energy (2nd ed.). New York: Springer-Verlag. Miller, B. A. (2000). Geography and social movements: Comparing antinuclear activism in the Boston area. Minneapolis: University of Minnesota Press. Pasqualetti, M. J. Nuclear-power impacts: A convergence-divergence schema. The Professional Geographer 35 : 427-436., 1983.